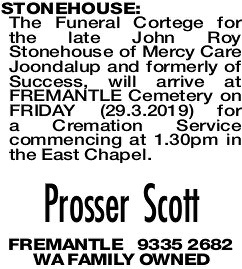 The Funeral Cortege for the late John Roy Stonehouse of Mercy Care Joondalup and formerly of Success, will arrive at FREMANTLE Cemetery on FRIDAY (29.3.2019) for a Cremation Service commencing at 1.30pm in the East Chapel. 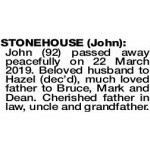 STONEHOUSE JOHN John (92) passed away peacefully on 22 March 2019. Beloved husband to Hazel (dec'd), much loved father to Bruce, Mark and Dean. Cherished father in law, uncle and grandfather. 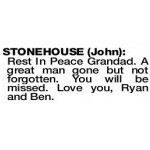 STONEHOUSE JOHN Rest In Peace Grandad. A great man gone but not forgotten. You will be missed. Love you, Ryan and Ben.